Once upon a time when Marlaena was small, the most fantastic occupations she could imagine were creators of art and writers of stories — people who could sculpt and paint, and people who could invent places and adventures wielded magic. When her grandfather asked what she would be when she grew up, she said she would be an artist or a writer. “Ohhh, no,” he warned, “you don’t want to do that. Artists and writers starve until they find a real job that pays. Be a teacher or a nurse.” Then he sat Marlaena on his knee and told stories he had written just for her. He wrote about the dobbies, who made mischief in Scottish homes long before Harry Potter met them. The most mischievous dobby of all hid socks, broke teacups, left the door open, and helped the flies come in. He tracked mud on the floor. He poked the cat so she jumped up and the dog chased her out the kitchen window, where she stepped in the apple pie on the sill. The dobby made a general mess of things until something else distracted him from his mayhem — perhaps a parade with a marching band in the town. On his way out the kitchen window, he grabbed a handful of pie. Always, the story ended, and Marlaena wished it would go on. Always, when someone asked her what she would be when she grew up, she tried to want to be something practical, like a brain surgeon maybe. That didn’t happen. 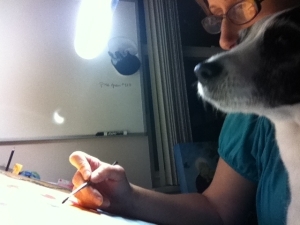 Years passed as they will, and after Grandfather had gone to where all grandfathers eventually go, Marlaena sat visiting with her grandmother, who asked about her paintings and what she worked on then. Grandmother asked her to fetch a box from the hall closet and to unwrap what lay inside. 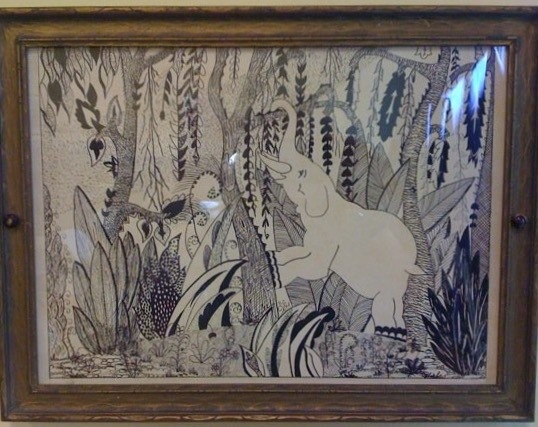 Yellowed newspaper cracked apart in Marlaena’s fingers, revealing a framed India ink drawing of an elephant in his whimsical jungle. “Where did you get this, and why isn’t it on your wall? It’s wonderful!” Marlaena inquired. “I made it when I was about 15,” Grandmother answered. Marlaena sat there gobsmacked, while Grandmother told of art courses she’d taken and of her interest in it. She showed Marlaena the little greenish dot on the side of her thumb that had come from a slip of her India ink pen. She told about giving up her pursuit of art when she went to college during the Great Depression. Her father had advised her to choose a practical career that would be useful and steady. “Do you wish you hadn’t given it up?” Marlaena asked. It’s coming along fine, Grandma, I wish I could show you. Hey, do you remember your elephant? He hangs in my studio above my drafting table, so I can see him every day. Thanks for the encouragement. I’ll pass it on.